Join our “Standards for quality youth policies in the Western Balkan countries” conference now! Тhe National Youth Forum – Bulgaria aims to explore, analyze and represent the interests and needs of young people in the country. For this purpose, we are bringing forward the value and the importance of youth organizations, their development and participation in the socio-political processes. In addition, we work actively within the European process of the Structured Dialogue for the joint development of youth policies by young people and decision-makers, for youth empowerment, quality youth policies, and implementing the methodology of the European Youth Forum on developing quality youth policies at European level and national level. 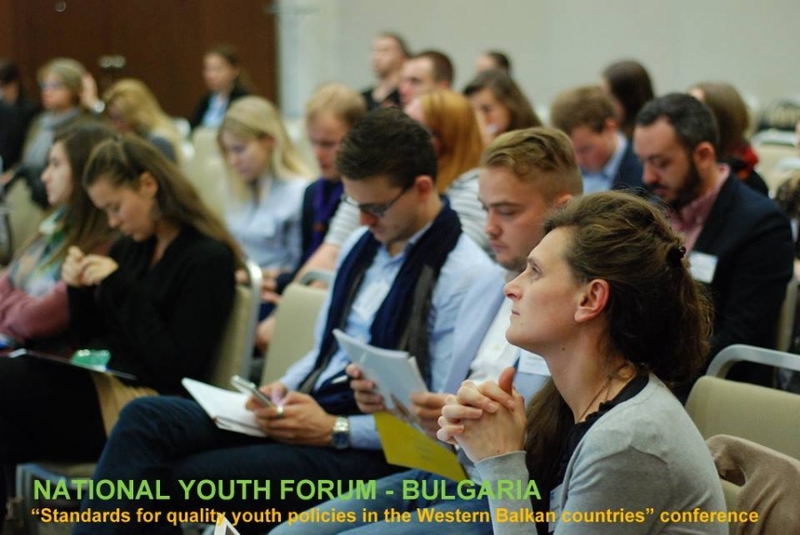 Inspired by the results from the Bulgarian Presidency of the Council of the EU we are delighted to invite you to partake in our event “Standards for quality youth policies in the Western Balkan countries”. We want to create a space, through an conference with the participation of the Western Balkan countries and Bulgaria, for exchange of information on the current state of the youth policies, good practices and opportunities to implement Quality Standards in the development of youth policies at national and regional level. The results of the conference will provide a basis for dialogue with the stakeholders and future cooperation between the partners in the framework of advocacy processes. On the other hand, the results will support the evidence-based advocacy approach of the NYF in the process of policy development with the responsible institutions. The results can be a basis for initiating processes to complement and amend current legislation in the field of youth policies so that they meet European quality standards. The conference will be held between 13th and 15th September 2018 in Sofia, Bulgaria. We will bring together international experts on youth policies the relevant stakeholders and youth representatives from each country in order to discuss topics related with the development of standards for quality youth policies. Each participant will have an experimental commitment through drafting proposals to improve the quality of youth policies which will be the basis for the advocacy efforts after the conference. https://nmf.bg/wp-content/uploads/2018/10/quality-standards.jpg 602 900 admin https://nmf.bg/wp-content/uploads/2018/10/NYF_logo-Horizont-1-2-300x138.png admin2018-08-31 17:51:142018-10-31 15:28:08Join our “Standards for quality youth policies in the Western Balkan countries” conference now!